Personally, I'm a big fan of the Roadside Picnic. I find this novel to be one of the most inspiring pieces of literature I've ever stumbled upon in my lifetime. Via the very first S.T.A.L.K.E.R. press announcement back in 2001, I've heard about the book for the first time, obtained it (which wasn't easy at all back then, almost like finding an artifact) and immediately got hooked on the whole post-apo genre. Due to this, I feel kind of obligated to give something back. With help of many great CoC addons, I've rebalanced quite a few aspects of the gameplay to fit the book's narration and atmosphere. 1) This mod compiles contents of quite a few addons into one - relatively stable - package. - Modified Pay for DocX Questlines (tweaked a lot). The reason is giving the player some goal at the beginning. It's rather superficial, sure, but it does the job very well. It doesn't get in your way of aimless wandering, so I'd call it a non-intrusive enhancement. And, when you run out of "important" stuff to do, you always have a place to visit... Non-zero-sum game scenario. Set both human and mutant populations to 0.25 in the main menu to feel the effect. In the book (and the movie) there were no NPCs in The Zone. Yet, it's another universe, another rules, another medium... All and all, The Zone with more space to breath is the way I like it. This one makes factions mechanics (and some related AI behaviour) less nonsensical. "The Zone is a very complicated system of traps, and they're all deadly. I don't know what goes on here in the absence of people, but the moment someone shows up, everything comes into motion. Old traps disappear and new ones emerge. Safe spots become impassable. Once your path was easy, now it is hopelessly involved. Wonderful sub-mod. Allows one to perform assassinations in enemy base Hitman-style. Those violent weather changes now make perfect sense. Not fully merged - only the stealth part has been incorporated. Moving silently and staying in the shadows can give you an advantage when executed properly. Weapons have more punch. For everyone. And let no one be left behind... Nerfed weaponry in the S.T.A.L.K.E.R. series is the most frequent complaint I've heard. Duty, Freedom and Mercenaries start with regular armors; they're an experienced, reliable people, or at least that's what I get from what the NPCs are saying. Monolith member starts as a regular monolithian, with somewhat limited weaponry due to the scripting limitations I hope to overcome one day. Soldiers are equipped with regular military uniform, as every soldier is. First, install Call of Pripyat base game. Second, install Call Of Chernobyl 1.4.12 release. Third, install Call Of Chernobyl 1.4.22 patch. Finally, just copy the archive contents to fresh CoC's 1.4.22 installation directory. Replace files when prompted. As for the HUD configuration, check out Smurth's Dynamic HUD page for detailed explanation. Game can work like a charm for six hours straight, and then crash to desktop randomly with no error message at all. Be sure to limit QS number to 1 and save very often (no issue on IronMan, right?). Also, the game likes to crash when entering new area, but no worry - autosaves will be all right. Every piece of feedback is invaluable. Big thanks to everyone for reporting bugs! Big thanks to everyone for great ideas! - Reintroduced Dynamic Anomalies, hurray! - Due to the severe stability issues removed Dynamic Anomalies... What an unfortunate turn of events... Hopefully it'll be re-merged once it'll get fixed one day. - Same thing happened to Rare Loot, but searching bodies will still bring less revenue than in vanilla game. In-house tweak inspired by The Rover movie ( Imdb.com ), where characters carried only a handful of ammo with them and fought against soldiers with short arms, stealth and an element of suprise. - Removed some additional textures that were out of place. - Tweaked "Rare Loot" by Dan so a tiny little bit more stuff comes up from dead bodies. - Fixed Fracture-related crash on certain levels. - Fixed armour upgrade price leftover values for some factions, most notably Duty. - Replaced Fractures with real (unarmed) Zombies altogether. If you like Fractures, delete configs/creatures/m_fracture.ltx file to bring them back from the dead, khe khe uhmph (caugh). - Rebalanced player damages to reflect how NPCs are configured. There are now like three times more damage zones registered, but they all scale very nicely and in principle you should receive a bit less damage overall (at least if you're not sitting ducks). - Little tweaks for starting loadouts to make them a bit more varied. - Fixed conserva animation and applied HUD glith fix by @SashaRed. Thanks! 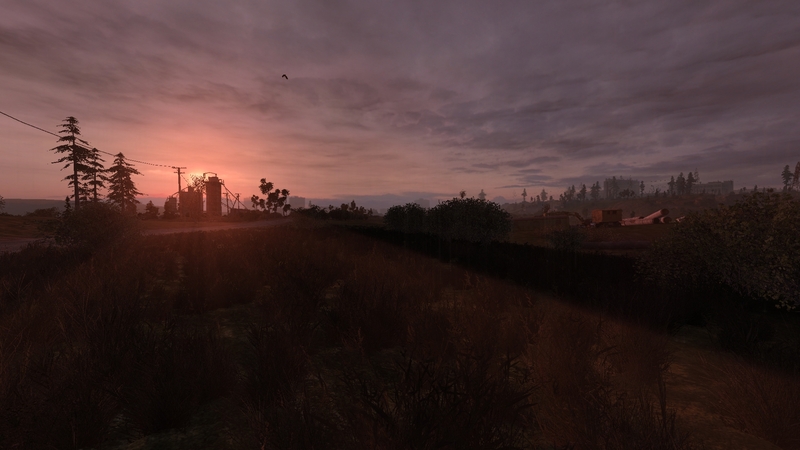 - Replaced main menu music with Stalker theme from @brainscorcher main menu version. Thanks! I like this idea. Less stalker in the Zone is the way I see it. 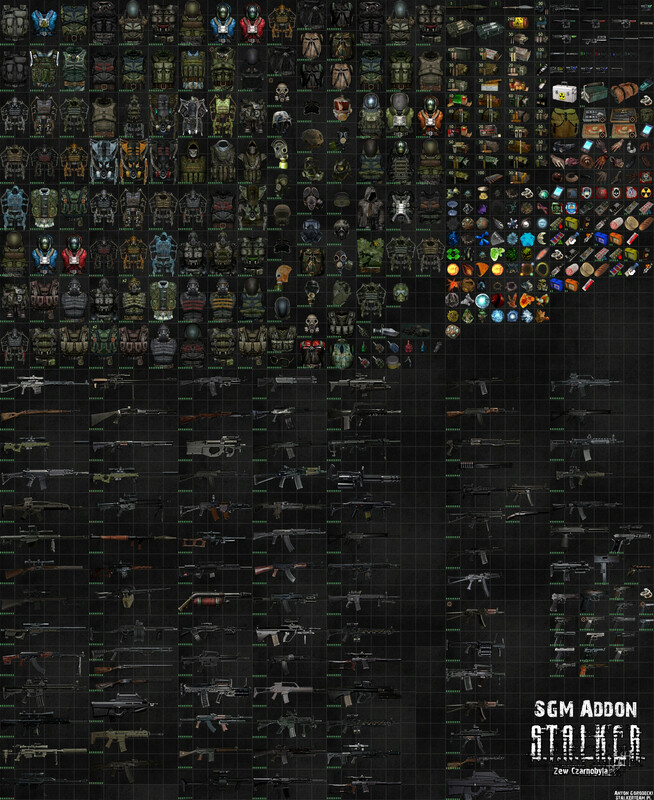 Nice addons compilation. I will surely give a try to this gameplay. Did you ask for permission when reusing all of those mods? You've used one of mine without asking. EDIT: My fault. I just remembered what license my mods are under. I'm sorry, I have not - tought those were public domain. If it's a problem, I'll remove your addon. No, no, it's okay. I'm actually glad it's in there, I was just a bit surprised. If something is under the Creative Commons license, it means that you can use it as long as you give proper credit. I'll give this a try later, broski. BTW. also thanks for that sounds. Simple, yet genius tweak IMHO. Did you specify that permission must be asked for in your mod's read me? If not it's kind of an unspoken rule that all that's needed is to either specify the name of the mod included or the name of the mod's author that was included. Or both the name of the mod and the author. punks a good guy. I'm sure he meant no harm. My bad. I've cleared it up. I've included all the proper links and credits in an addon description right from the start. If someone wants to stir away from my upload, please send me a PM and I'll do what's needed. A mega mod pack sounds interesting but I've long since dropped using Arsenal Overhaul myself and wasn't a fan of a few of the major mods you used even though I'm curious about the personal modifications you made. Well, it's definitely not one-size-fits-all. I made this one first and foremost for myself, and I thought: "Hell, someone else might actually like it". So here it is. If you'd like to give it a try and you wouldn't have much fun - no hard feelings. And yeah, AO can be weird at times... But the balancing is rather good, and more ammo variety makes the game actually harder, especially on the SIM side of the gameplay. You could add an option to change AO out for OWR if you understand not everyone likes AO. It would require quite a lot of changes throughout the whole stack, not to mention various bugs resulting from mixing AO + OWR + SDH... I'll play around with an alternative version, see if it's possible to mix those together in a stable fashion, but I can't promise anything. If I get working on such a voice pack, I'll let you know. Oh yeah, I know that line. I believe it's part of the Ukrainian localization. I picked up a lot of Polish from the Witcher games, and I am a Slav myself. You think my accent is good? **** yeah. I wan't to see this pack. Idea is awesome. Thanks. If you wanna try, you can send something in Polish. I can apply a gas mask filter. Wow thanks i like it !!! how are you going to make updates though? Yeah, some kind of package manager could be useful, ain't it? Not that it really matters, but there's already a mod called Roadside Picnic for CoM. It has nothing in common with your mod though. It adds the hand crank generator from Metro, cooking low-tier mutant meat over campfires, and the deployable tent. Just thought I'd mention it in case a flood of Russkies come in here yelling блядь сука. Thanks for the package, it's complete opposite to my old playthrough with SGM addon and higher population. There is something cool at empty spaces where stumbling upon living thing give a thrill. Yeah - It's not a place to let your guard down. One minute you're strolling through Limansk, enjoying the sun, in the next... boom, sniper has you. Higher population does not give justice to this game in my opinion. Having to fight at constant rate gets repetitive. With lower populations + unlocked AI the issue of habituation is never present. Could you point me to that SGM addon for COC? Would be much appreciated! Does the SGM mod come with quests or is it simply a merge of the weapons, outfits and artifacts? Does it have an english translation or is it just in polish? Disregard, downloaded and now playing, it doesn't affect language. Only not translated things are new artifacts and items/guns. Can you upload it without Smurth's Dynamic Hud or as a seperate addon?It has too many varieties and its very hard to change which one you like. Unfortunately - no. Minimalistic version without minimap + disabled crosshair is my way to go. But hey - you can always overwrite included version with your own, can't you? Yeah, just download Smurth's mod, and swap over the option files you prefer. I use the version with nothing except the Ammo icons, since otherwise you can't tell if you are on Full auto shooting armor piercing at rats. That's the biggest problem with no hud.